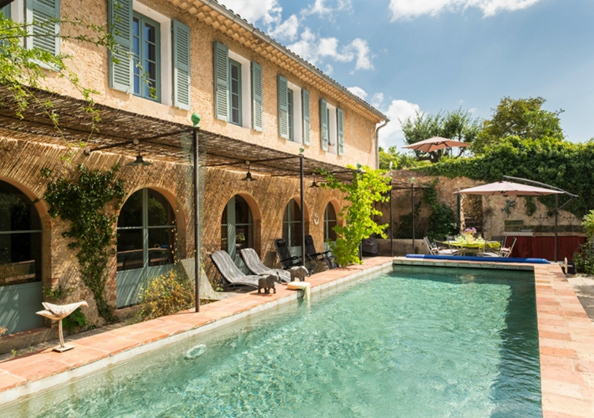 Originally a forge, La Ferrage has been beautifully transformed into a charming and spacious House, with a lovely private swimming pool, in the heart of Provence. Whilst the House provides an oasis of peace and quiet behind its classic Provençal facade, it is just a short stroll from the highly photogenic small town of Aups, arguably the truffle capital of France. "Thank you for finding 'La Ferrage' for our really wonderful holiday. It proved absolutely perfect for our family. The house offered excellent, spacious accommodation for all of us, and is equipped to the highest standards. The swimming pool is particularly imaginative, and was a real hit with all our party. It was super to be within only a gentle stroll of the village centre with its array of shops, restaurants and cafés. It was a real delight to barbeque our dinner, and then wander down to the crêperie for our dessert! Thanks again for finding us a truly excellent vacation." " We had a wonderful time in this beautiful Villa, and hope that one day we may return to "La Ferrage". La Ferrage, meaning ‘The Forge’, was built in the 17th century and converted with flair and sensitivity by the current owners in the 1990’s. The House has been furnished and finished to the highest standards and is extremely comfortable and spacious – indeed, it is difficult to envisage the elegant world which lies behind its rather secretive facade. It displays many classic Provençal features such as shuttered windows, terracotta-tiled floors and high ceilings, all of which help to keep the interior pleasantly cool, even in the hottest weather. There is parking for 2 cars in the small gravelled area at the kitchen end of the House, as well as parking for other vehicles on the tree-lined avenue at the foot of the small lane which leads to the House’s parking area. Main entrance - imposing double doors opening from the lane onto the hall. Utility Room - with a washing machine and a separate dryer, a large back-up fridge/freezer, an ironing board and an iron, plus the boiler and a large water tank. Bedroom 1 - with a 5 ft bed, exposed raftered ceiling and a wall of windows/French doors opening onto the pool area. An ensuite (Bathroom 1) has a bath and a W.C. Bedroom 2 – with double, interconnecting doors into Bedroom 1, a 5 ft-wide bed and windows/French doors opening onto the pool area. An ensuite (Bathroom 2) has a walk-in shower and a W.C.
Study - with a large collection of DVD's. The French doors opening onto the pool area are kept locked for security's sake. The main living areas of La Ferrage is vast and open plan with wide archways separating the sitting room from the dining and kitchen areas. There are windows on all 4 sides making the living areas very light and airy. Sitting Room - with an exposed raftered ceiling, striking modern pictures adorning the walls and a number of very comfortable sofas and armchairs. There's Broadband/Wifi internet access, plus a 50 inch Plasma TV with Freeview/Sky channels, a DVD player, and a collection of DVD’s. Dining area – with an exposed raftered ceiling and versatile rectangular table seating 20. The table comprises 6 separate sections which allow a number of permutations in terms of the shape and size of the table. Closer to the kitchen is a second (round) table, seating 6. Kitchen – adjacent to the dining area and state-of-the-art, with a 5-ring ceramic hob and an extractor hood, a fridge/freezer, plus a second fridge, 2 full-size ovens plus a microwave, a dishwasher, toaster, coffee-maker and electric kettle, plus a vast array of cookware, crockery, cutlery and other utensils. Off the kitchen is a larder and, as La Ferrage is built on a slope, the door at its far end opens onto a small breakfast/dining terrace with a table seating 8 plus sun loungers and, around the corner, the gravelled parking area. Normal access is easiest through the kitchen door. Bedroom 3 – the very large Master Bedroom with a 6 ½ ft-wide bed which can be split into 2 singles and a separate , full lenght single bed. An ensuite (Bathroom 3) has a bath, a walk-in shower, a bidet and a W.C. (The mezzanine floor, accessed only from bedroom 3, is the owners' office and is private). To enjoy the Provençal sunshine, La Ferrage centres around the sheltered and very private pool area, enclosed by high walls topped with shrubs. Adjacent to the kitchen is a small breakfast/dining terrace overlooking the pool, with a table seating 6, a small lawn, some shady trees and around the corner, the gravelled parking area. From this terrace, steps descend (via a door which is usually kept locked) to the pool area. There is also access to the pool area through the 4 French doors on the ground floor. The filtered swimming pool is 9 metres long, 3 metres wide, and 1.5 metres in depth. The water is slightly saline (approximately the strength of human tears) to avoid the use of chlorine. The pool has an alarm system which, when switched on, is activated if a body the average weight of a baby (or heavier) enters the water. Being relatively shallow, diving is not encouraged. Within the pool area there are sun loungers, comfortable chairs, a large sun umbrella and a dining table seating 8. There is also a summer kitchen, complete with a sink, gas ring and barbecue. If rain seems likely, guests are requested to close the sun umbrella and to place all cushions inside. La Ferrage is just 500 metres (and an easy stroll), from the main square of the highly photogenic large village of Aups, arguably the truffle capital of France. The House is set back from the road to Tourtour and accessed by a lane that leads to a few houses as well as to the local olive mill and its shop. Although only a trickle of vehicles use the lane over the summer months, it is much busier during the autumn and winter, when the olives are being harvested and pressed. Aups is an interesting medieval village, complete with museum, churches and a central village square. Aups has a good range of shops and a number of restaurants in various price ranges. Its market, which takes place on Wednesdays and Saturdays, is a local attraction. 30 minutes' drive north of La Ferrage is the 10 km-long Lac de Ste Croix with excellent swimming from its many beaches in its crystal-clear water as well as wind-surfing, sailing and pedalos. To the east of Lac de Ste Croix are the dramatic Gorges du Verdon, known as the Grand Canyon of Europe and providing all kinds of exhilarating pursuits including hiking, canoeing, kayaking, canyoning and mountain biking. Electric motor boats can also be hired to visit some of the gorges. Tenants will be met on arrival, and will be shown round the property. A cleaner is employed by the owners for 3 hours on one mid-week day. Unless otherwise agreed, she will concentrate on general house cleaning, including the kitchen and bathrooms. She should be paid direct by tenants for any agreed extra hours/days of work at the rate of €14 per hour. Maintenance of the pool and the grounds is the owners' responsibility and a pool man will clean and check the pool once a week or when requested. As long as sufficient notice is given, a baby-sitter and/or a part-time cook can probably be arranged. His/her/their wage/s will be the tenants' responsibility and, if requested, will be ascertained prior to the commencement of the tenancy. There are telephones throughout the House and a clearly labelled iPod stereo cable attached to the hi-fi system to which iPods can be connected. Although neither a cot nor a high chair are currently provided, they can be made available on request. There is a good selection of English-language books throughout the House. This is an all-year-round House, with central or underfloor heating throughout. The house information folder explains how everything works (both inside and outside). It lists the names and telephone numbers of a doctor, dentist, electrician, plumber, pool man, etc, plus other emergency and useful numbers. 50 metres further up the lane from La Ferrage is a working olive mill which has a charming shop selling several varieties of its own olive oil, as well as bottled olives and many other delicious products. A nearby lavender farm makes and sells lavender essence and related items. There are also nougat and honey producers in the vicinity. There are many restaurants in the area ranging both in price and quality, with truffles being the local speciality. Details and descriptions of some of them are given in a helpful information folder at the house. Markets abound in the local towns and villages, with details of where and when in the information folder. Local pottery and Provençal fabrics are very popular. - Wonderful walks in all directions. There are tennis courts in Aups, just 3 minutes' walk from La Ferrage. Details are in the information folder. In addition to Aups, there are many stunning towns and villages to explore in the vicinity: Tourtour is known as the 'village in the sky'. Entrecasteaux boasts a marvellous Château with grounds designed by Le Nôtre who also laid out those at Versailles. Salernes has numerous pottery shops and an excellent Sunday market whilst the pottery centre of Moustiers Ste Marie is also noted for its metal star suspended across the gorge above it, brought home in triumph from the Crusades. During August the whole of the Var is "en fête". This can be wonderful, with concerts, fireworks, folkloric events and special markets for local pottery and handicrafts. Aups has a week of lively festivities, usually around the middle of August. Vineyards abound in the region, producing red, white and rosé wines (rosé wines being a Provençal speciality). Many offer tastings and on-the-spot purchases and details are in the information folder. The house also has an annotated copy of Ian Parkin's indispensable booklet "The 100 Top Vineyards in Provence". There are a number of children's adventure playgrounds and zoos in the area, including one near Vidauban which provides a range of activities for all ages, from 3 to the late teens. Details of these, as well as quad-biking opportunities for older children, are in the information folder. This property is available for longer lets of anything between 4 weeks and 3 months at a lower/negotiable rent. Please dont hesitate to contact us if this could be of interest. A Booking and Security Deposit of £500 will also be payable to Anglo French Properties Ltd on signing the Rental Agreement. This will secure the booking and will cover: (a) the cost of telephone calls made on the house telephone during the tenancy, (b) electricity consumed by the tenants, (c) the cost of replacing/making good any losses, breakages and/or damages incurred during the rental, and (d) any exceptional cleaning work which may be required on its conclusion. This Deposit will be refunded (less any deductions as outlined above) within 4 weeks of the end of the tenancy. Unless otherwise agreed, there should not be more than 6 people (including children and babies) staying in the House at any one time. The owners' insurance policy requires that all outside doors are locked and all windows are securely closed whenever tenants are away from the property.